Kangaroo Island is a spectacular haven for a wealth of native wildlife, the majestic scenery here is home to sea lions, kangaroos, koalas, wallabies and penguins, explore eerie underground caves, climb rugged rock formations and swim, snorkel, fish and dive the ocean from sensational beaches and secluded coves. Your friendly local driver will pick you up in the comfortable air-conditioned coach before sharing experiences, fascinating facts and enchanting stories in the on-board full commentary. Board the ferry to Kangaroo Island and spend time at Penneshaw. Leaving Adelaide, enjoy a scenic tour alongside the Torrens River through the spectacular Torrens Gorge, see Kangaroo Creek Reservoir, Millbrooke Reservoir, Williamstown (beautiful stone buildings) and learn the secrets of Barossa Reservoir's 'Whispering Wall'. Stop at Lyndoch Bakery for complimentary coffee or tea and a German sampler plate of sweet treats. Discover the art of great winemaking on your 'Behind the Scenes' guided tour of Richmond Grove Wines, housed in a charming historic chateau. Enjoy a tutored wine tasting incorporating introductory wine education, view the original winery built in 1897 with traditional winemaking equipment. Stop at Kaesler Winery for a delicious Special Lunch, your two course winery restaurant lunch with the opportunity to taste wines from this highly regarded vineyard. Experience the panoramic views over the Barossa Valley from Mengler's Hill lookout, continue through the old mill town of Woodside and the Adelaide Hills. Stop at Hahndorf (Australia's oldest German settlement), stroll under the Elm trees along Hahndorf's main street, see quaint cottages, craft shops and tea rooms. See the delightful villages of Crafers, Stirling, Aldgate (all set amongst the lush greenness of the Adelaide Hills) and Bridgewater (with Bridgewater Mill and Waterwheel). Head back to Adelaide with a deep appreciation of the Australian wine industry and the beauty of the Adelaide Hills. The Fleurieu Peninsula is a holiday playground of wineries, seaside towns and lakes whose population trebles during holiday periods. The splendid seaside resort township of Victor Harbour is where the mouth of the massive Murray River finally meets the ocean. The internationally respected wine region of McLaren Vale has more than 60 cellar doors and produces amazing Shiraz, Grenache, Cabernet Sauvignon and Chardonnay wines. The old paddle-steamer port of Goolwa is on Lake Alexandrina, near the Murray Mouth, and is joined by a bridge to Hindmarsh Island . 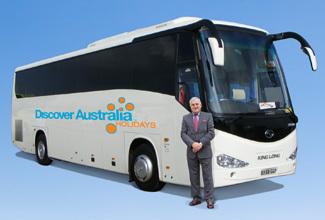 Your special overnight Luxury Coach Touring includes return ferry travel to Kangaroo Island, 1 breakfast and 1 lunch. The luxury vehicle has a personalised air-conditioning, a video system and an onboard toilet. Blue Mountains (Adelaide to Sydney): Explore the magnificent Blue Mountains by railway, cableway and skyway. The "Deluxe" hotel option has superior facilities, stylish room and first class service (typically 4 stars). 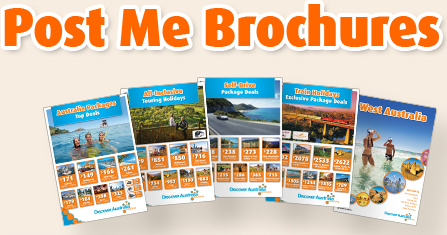 Upgrade this package to 6 nights in a "Deluxe" Adelaide hotel, from just $120 per person. The “Luxury” hotel option is upscale with a more luxurious feel for the discerning traveller and great for celebrating an anniversary (typically 5 stars). Upgrade this package to 6 nights in a "Luxury" Adelaide hotel, from just $250 per person. 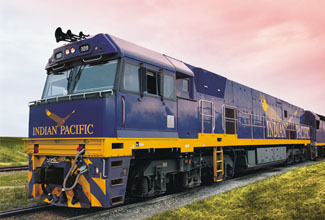 The Indian Pacific to Adelaide All-Inclusive with Kangaroo Island Stay is very popular. Many dates book out well in advance, please book soon.